That is pretty! I've avoided these due to the price, too--Sally Hansen and NOPI at least give me a full size bottle for my $8. Ohhh pretty! I just picked this up the other day and it was on clearance at my Target! AND I had a $2 coupon so I was stoked about that! Keep seeing Pixi on line = but I don't have a Target close at all - good 75 miles to the nearest one - last time in there had to look for vacuum and after that had to put blinders on to picking up anything else - pocket book was empty! Maybe so day - they seem like they might be a brand with a good cream formula which is my all time fav formula - call me old-fashion but give me a great cream and I am sooo happy...I am also lazy and a good cream is fast/easy route to mani/pedi! I adore this on you. Is it similar to any of the China Glaze neon shades? This pretty pixi looks similar to Flirty Tankini. If I could get this on sale, maybe I would go for it. It is so pretty. 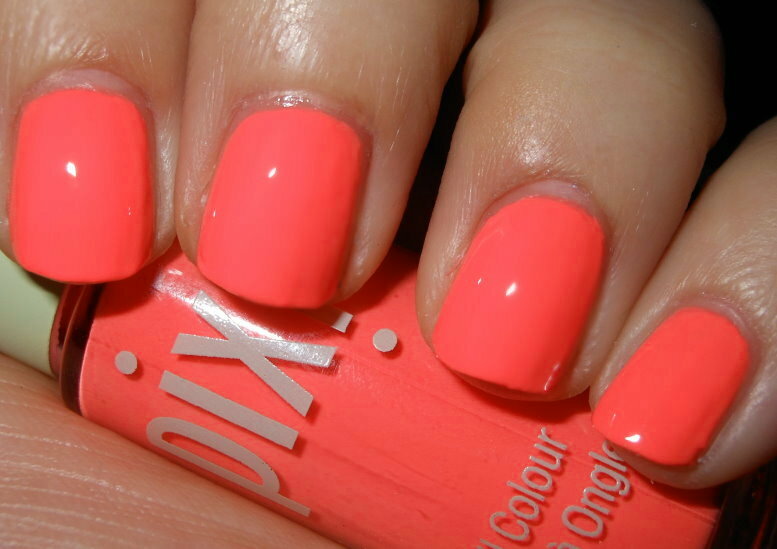 Craving this color still- such a pretty color! Unique, too!